If the counterculture of the 1960s contributed to the transition from modernism to post-modernism, can we then think that a new "post-Internet" era is born out of the appropriation of social networks as a diverted tool of the new media? 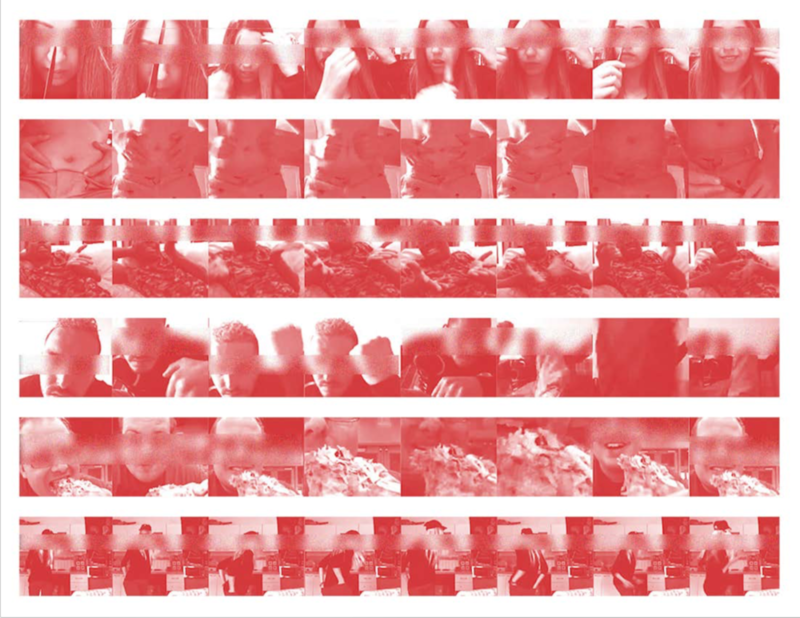 Peritopia attempts to explore the elusive body language of the Internet, specifically that of Periscope, and seeks to define it today, starting from its beginning, in the 1990s, with the online live-streaming. Peritopia is an installation exhibiting a live performance re-enactment of gestures taken from the Periscope app and live-streamed back on the online platform. Periscope is the online live-streaming app acquired by Twitter. It was founded on the principle of broadcasting videos of local political and social manifestations of people to be shared around the world. However, it has become a tool of self-expression and self-representation for most of the users, allowing them to push the limits of their actions. The performance of Peritopia consists of looping the gestures taken from the users of Periscope, by experimenting them in a public space, and then performing it as a mash-up in the installation space while simultaneously live-streaming it back on Periscope. Observation of the Periscope users/scopers on the app, and choice of six gestures of six users. Gestures re-enactment in a public space: Geneva Panoramic Elevator. Mash-up performance of the gestures taken from Periscope, reinterpreted in the elevator, and live-streamed back to Periscope. Si la contre-culture durant les années 1960 a contribué à la transition du modernisme au post-modernisme, peut-on alors penser qu’une nouvelle ère « post-Internet » est née de l’appropriation des réseaux sociaux comme un outil détourné des nouveaux médias ? Peritopia tente d’explorer le langage corporel évasive d'Internet, spécifiquement celui de Periscope, et cherche à le définir aujourd’hui depuis ses débuts, dans les années 1990, avec la diffusion en direct en ligne. Peritopia est une installation sous forme d’une performance live qui présente une reproduction de gestes hétéroclites issus d’utilisateurs la plateforme en ligne Periscope. Periscope est une application de diffusion en direct acquise par Twitter. Elle est fondée sur le principe de la diffusion de vidéos de manifestations politiques et sociales, réunissant des gens du monde entier. Cependant, Periscope est devenue un outil d'expression et de représentation de soi pour la plupart de ses utilisateurs, leur permettant de repousser les limites de leurs actions. La performance de Peritopia consiste à mettre en boucle des gestes d’utilisateurs de Periscope, en les expérimentant en premier lieu dans un espace public, et en les performant sous forme de mash-up dans l’espace de l’installation tout en les retransmettant en direct sur Periscope. Observation des utilisateurs/scopers sur l'application de Periscope, et choix de six gestes de six utilisateurs, à partir de la plateforme. Reconstitution de gestes dans un espace public : Ascenseur panoramique de Genève. Performance en mash-up des gestes pris de Periscope réinterprétés dans l'ascenseur, et retransmis en direct sur Periscope. Smartphone, wood, haze machine, two ellipsoidal reflector spotlights, red filters, two video projectors, two PVC screens, two mac minis, black fabric. Lab-of-Arts Association, Régis Bagdassarian, Fabio Bergamaschi, Helena Bosch, Sergio Jaramillo Buitrago, Sara Dominguez Carlucci, Chun Hua Chien, Enrique Corrales, Damien Delille, Claire Dessimoz, Beatriz Granado, Oliver Graney, Marguerite Humeau, Rosario Hurtado, Yara Kazan, Naoyuki Kiyota, Blanche Lafarge, Oscar Lhermitte, Arno Mathies, Malak Mebkhout, Alexandra Midal, Jessica Maria Nassif, Jeanne Pasquet, Fidel Peugeot, Eleonora Pizzini, Joseph Popper, Laura Potter, Felipe Ribon, Sonia Rickli, Netillo Rojas, Dominic Robson, Artscenique Sarl, Alexandre Simian, Noam Toran, Théâtre de l’Usine, Jonathan Moy De Vitry, Nick Williamson, Mathias Zieba. Régis Bagdassarian, Helena Bosch, Simone Holliger, Rosario Hurtado, Yara Kazan, Katrin Kettenacker, Blanche Lafarge, Charlotte Laubard, Arno Mathies, Aurélien Martin, Jessica Maria Nassif, Xavier Plantevin, Artscenique Sarl, Alexandre Simian, Stéphane Taillandier, Jonathan Moy De Vitry. 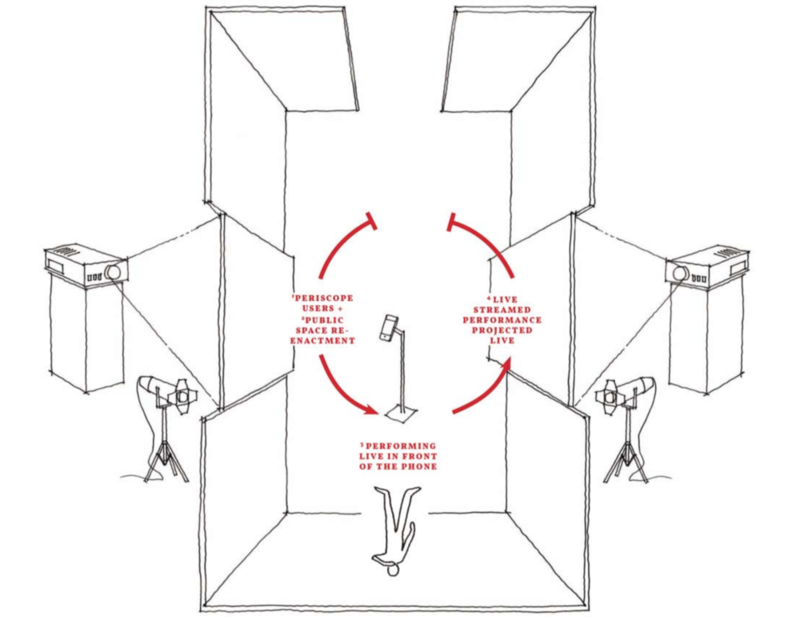 Peritopia only intends to showcase general and honest reactions towards a performance that is replicated from an online source; Periscope, in order to compare the digital reactions of the viewers with the ones in the material space, as well as shining the light, in a face value way, on what happens on online spaces.